When it comes to vaccinating their babies, bees don’t have a choice — they naturally immunize their offspring against specific diseases found in their environments. And now for the first time, scientists have discovered how they do it. The findings appear today in the journal PLOS Pathogens. In a honey bee colony, the queen rarely leaves the nest, so worker bees must bring food to her. Forager bees can pick up pathogens in the environment while gathering pollen and nectar. Back in the hive, worker bees use this same pollen to create “royal jelly” — a food made just for the queen that incidentally contains bacteria from the outside environment. After eating these bacteria, the pathogens are digested in the gut and transferred to the body cavity; there they are stored in the queen’s "fat body" — an organ similar to a liver. Pieces of the bacteria are then bound to vitellogenin — a protein — and carried via blood to the developing eggs. Because of this, bee babies are "vaccinated" and their immune systems better prepared to fight diseases found in their environment once they are born. One destructive disease that affects bees is American Foul Brood, which spreads quickly and destroys hives. 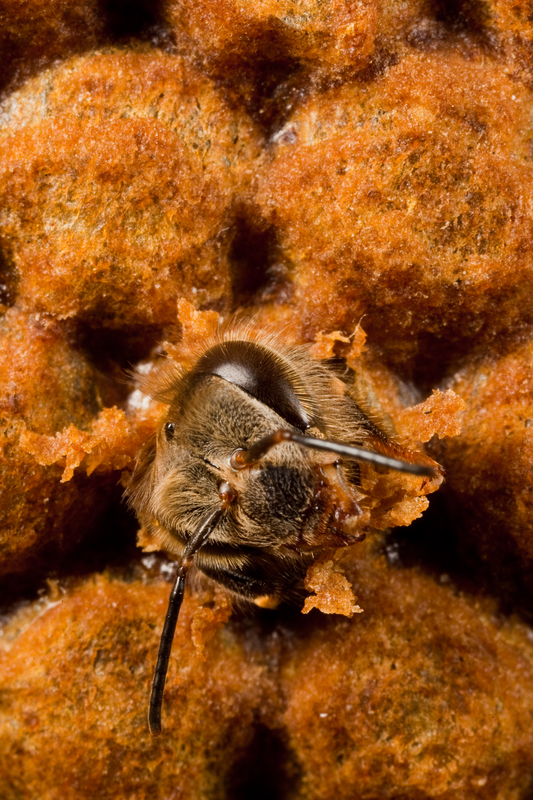 The bacterium infects bee larvae as they ingest food contaminated with its spores. These spores get their nourishment from the larvae, eventually killing them. During the past six decades, managed honey bee colonies in the United States have declined from 6 million in 1947 to only 2.5 million today. Not only are bees affected by diseases, they have been decimated by a phenomenon called colony collapse disorder. Researchers don’t know exactly what causes this, but pesticides, pests, pathogens and nutrition problems may all be contributing factors. According to a 2014 report by the U.S. government, pollinators are instrumental for a healthy economy and critical to food security, contributing 35 percent of global food production. In North America, insects pollinate 87 of the top 115 food crops and honey bees are vital in keeping fruits, nuts and vegetables in our diets. This discovery could have far-reaching benefits for other species, as well as substantial, positive impacts on food production. All egg-laying species, including fish, poultry, reptiles, amphibians and insects, have vitellogenin in their bodies. This study was funded by several Academy of Finland grants 265971, 251337 and 252411, as well as Norwegian Research Council grants 180504 and 191699. ASU School of Life Sciences is an academic unit of ASU College of Liberal Arts and Sciences. This fall, the ASU Art Museum’s Ceramics Research Center will present "Statement Piece: Erik Gronborg and Ehren Tool," an exhibition that brings together two socially-engaged artists from different generations. The exhibition is curated by the ASU Art Museum’s curator of ceramics, Garth Johnson, and will be on view Aug. 1 through Nov. 21, 2015 at the ASU Art Museum Brickyard, located at 7th Street and Mill Avenue in downtown Tempe. A reception for the exhibition will be held Friday, Sept. 11, from 6:30–8:30 p.m. (with a members, alumni and press preview from 5:30–6:30 p.m.). Tool will spend that day making cups in the gallery space at the ASU Art Museum Brickyard. Members of the public are welcome to collaborate with Tool to create their own handmade ceramic cup. This exhibition is supported by the Helme Prinzen Endowment and by the Museum of Contemporary Craft in Portland, Ore., Ron M. Werner and Scott McCoy, Dan Berman and Greg Weller, James Wallace and Julie Bergstrom, Erik Gronborg and Ehren Tool.